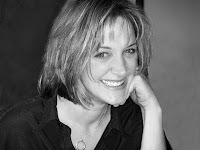 Last fall I had the chance to meet new author Kimberly Marcus and read her first novel-in-verse, exposed, out this week. What an amazing new talent! This is a powerful and gripping story, as well as a fully realized work of poetry. If you like Laurie Halse Anderson's Speak, you should not miss exposed-- they are interestingly parallel in both the premise and tone. Two girlfriends, Liz and Kate, are torn apart by what happens one night at a sleepover at Liz's house. And it's Liz's brother who has attacked her best friend. Or has he? How the truth emerges is totally compelling and never melodramatic. And the rippling effects on each girl, their friendship, their futures, and even their families are raw and real. 1. Can you talk about your “upbringing” in poetry? Childhood/teen experiences with poetry? Formal training or personal favorites? I’ve always been a lover of the rhythm of words, and remember writing my first poem, an ode to my stuffed teddy bear, when I was in kindergarten. As a teenager, I kept a journal where I would write poetry about the things that mattered to me - love, friendship, where I fit in the world. While I’ve immersed myself in craft books on poetry and have always been a poetry reader, I’ve never had any formal training (though I would love to do so). My poetic tastes range wide, from Jack Prelutsky, Lee Bennett Hopkins, and Maryann Hoberman to Ted Kooser, Billy Collins, and Mary Oliver (with many, many in between). 2. Why exposed as poetry? Did you start out intending to write this story in free verse or how did that evolve? Exposed didn’t start out in free verse. It began as a novel in prose. One day I found myself stuck on a scene, unable to get to the heart of what I was trying to say. A writer-friend of mine, who knew of my love for poetry, suggested I try rewriting the scene as a poem to see if it would help me get unstuck. It worked and I loved the way it forced me to hone in on core feelings, loved the way it challenged me, so I went back and rewrote earlier scenes that way, too. A short time later, as I was looking over those free verse scenes, I thought about how they were similar to snapshots of emotion. It was then that a novel about a photographer, told in snapshots of free verse, was born. 3. Which aspects of telling this poetically did you find the most challenging? I think any type of writing presents challenges to the author. For me, the free verse form required working hard to find the perfect words and phrases needed to get to the heart of a scene. I spent a lot of time reading the writing aloud, figuring out where line breaks could be used to greatest effect (and affect), and trying to find ways to make those words and phrases play “double duty” by packing more than one meaning. Another challenge in the telling was trying to make sure that the novel felt “full,” regardless of its word count. The story, as a whole and regardless of the form, had to work. I hope, for readers, I met those challenges. 4. Are ther e any particular works or poets that you have found especially influential as you worked in this genre? I am a lover of free verse novels done well and, luckily, there are many of them out there. The first free verse novel I read and fell in love with was Stop Pretending: What Happened When My Big Sister Went Crazy, by Sonya Sones. 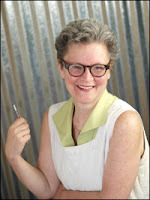 Other novelists I love, who have written novels in verse and who serve as inspirations are Karen Hesse, Helen Frost, Virginia Euwer Wolff, Jacqueline Woodson, Tracie Vaughn Zimmer, Hope Anita Smith, Ellen Hopkins, Stephanie Hemphill, Mel Glenn... I could go on and on. 5. Some novels in verse include titles for individual entries and some do not. Why did you decide to include them? I first played around with titles as a way to link the scenes and as a way to mark time. The main reason I kept them, if I’m being completely honest, is because I had so much fun creating them. I would write a poem, polish it, then challenge myself to find the best title to sum it all up, sometimes making it so the title didn’t make sense until the reading of the poem was complete. 6. How did you decide on the first person point of view and how did you decide that point of view was Liz’s and not Kate’s? I mentioned earlier that Exposed didn’t start out in free verse. It also didn’t start out as Liz’s story. Originally, the story did belong to Kate. But the more I wrote, the more I found myself drawn to Liz’s view of what was happening. It was a perspective I hadn’t seen before, and her position intrigued me. For a while I tried writing the novel in alternating chapters, told from both points of view, but I eventually gave the story over to Liz alone. In some ways, I think, Kate’s story would have been the easier one to tell because I had a fairly good idea, at the outset, of how her story arc would evolve. I’m never one to do things the easy way though, and Liz’s arc was a mystery to me. And I’m challenged by mysteries, so I had to keep writing to see how she would end up. 7. Can you describe your poetry writing process? How you craft a poem? How you organized all these poems to suggest characters, setting, and plot? Try as I might, I can’t seem to write in a linear fashion. Most of the organization of the novel structure as a whole occurs at the end of a draft. And scenes tend to come to me, initially, as snippets of running dialogue between characters. I try not to worry too much about how things look or sound at this point in the process. I’m just trying to get to know my characters. It’s in later drafts that I figure out exactly what it is that I’m trying to do with a particular scene, what the emotional core should be. That’s the time I think about things like lyrical beats, best word choice, necessary tag lines, the right amount of description, and imagery. And then I try to put the whole thing together in a way that makes sense! This often involves rearranging stanzas within a poem so they pack the most lyrical punch. That was it. Beautiful poetry, don’t you think? (Insert laugh track here). 8. Do you plan to continue with poetry and/or novels in verse? For children? For YA? Any tidbits you can share about works in progress? As I just mentioned, I’m working on my second novel in verse now. 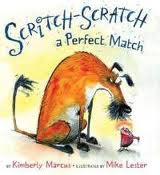 I also have a rhyming picture book called Scritch-Scratch A Perfect Match, illustrated by Mike Lester, coming out with GP Putnam’s Sons in April. It’s the story of how a flea brings a lonely dog and a lonely man together. It’s filled with wordplay and onomatopoeia and was so much fun to write. I feel very lucky to be able to write for both children and young adults, and hope to continue doing so for many years to come. This poem is a cathartic moment in the story, but it stands on its own too-- nearly everyone experiences such a revelation at some point in life, don't you think? Thanks to Kim for her stunning book and for sharing so generously in this interview. Thanks also to Casey Logan (and Random House) for helping make connections and provide images. 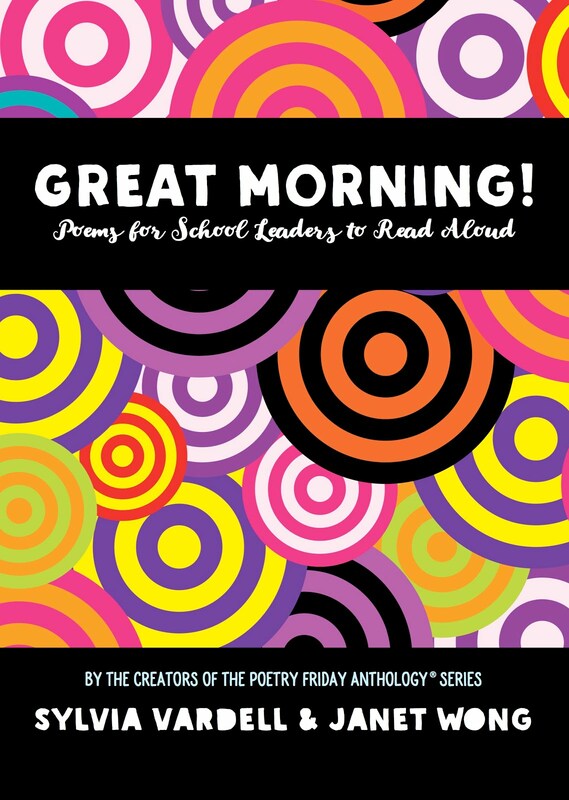 Join the rest of the Poetry Friday group at Read, Write, Believe. 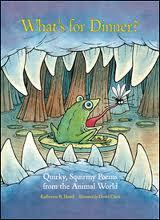 This annual award goes to the best book of children's poetry published in the United States in the preceding year. 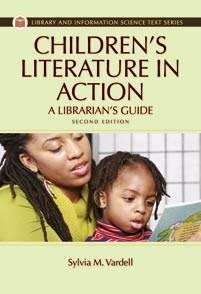 It is co-sponsored with Lee Bennett Hopkins himself along with the University Libraries, the Pennsylvania Center for the Book, and additional sponsor, Pennsylvania School Librarians Association. In a monastery in the mountains of Mourne during the Middle Ages, one young monk struggled to focus on his task: copying the Bible and other scholarly books with plain brown ink made from wood bark in plain brown books in his plain brown robe at his plain brown desk. 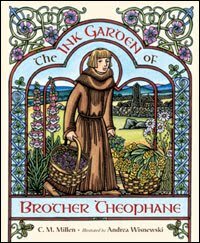 Brother Theophane was soon transferred from the scribe’s room and assigned to make the ink that the brothers used. With his natural curiosity, Theophane discovered that inks could be made from other plants besides the wood bark. Berries and leaves produced other beautiful colors. And soon, the books the monks made were illuminated with colors and drawings. C.M. Millen’s charming story of a young monk who defied the discipline of the monastery and found his own way to express the beauty of the world will inspire young readers to explore their own world and find their own voices. 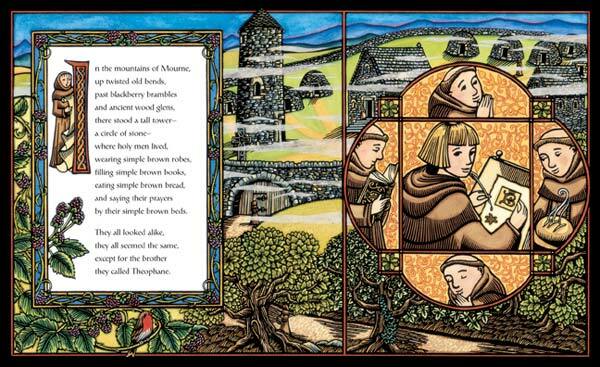 Andrea Wisnewski’s illustrations, inspired by the illuminated letters that the medieval monks created in books like the Book of Kells, bring to life the colors and beauty that surrounded Brother Theophane amidst the plain world of the monastery. Congratula tions, C. M. Millen! 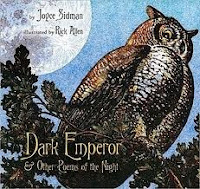 And congratulations, Joyce Sidman, for another well-deserved recognition for The Dark Emperor, too. 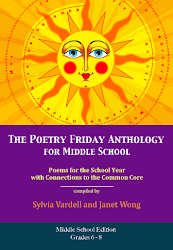 Once again, a variety of poetry items have crossed my desk, so I thought I'd gather and share them here. Plus, please indulge a bit of self-promotion of a variety of poetry projects I have in development with colleagues and students. More to come! IBBY Ireland recently announced that the 2010 CLPE Poetry Award was won by Carol Ann Duffy for her anthology, New and Collected Poems for Children, illustrated by Alice Stevenson. The shortlist for the Award, which was generously sponsored by Travelling Books, included James Carter and Graham Denton's Orange Silver Sausage, Adrian Mitchell's Umpteen Pockets, illustrated by Tony Ross, Michael Rosen’s A-Z; The Best Children’s Poetry from Agard to Zephaniah and Kit Wright's The Magic Box, illustrated by Peter Bailey. The judges were John Agard, Andrew Lambirth and Lindsay MacRae. The chair of the judges was Margaret Meek Spencer. 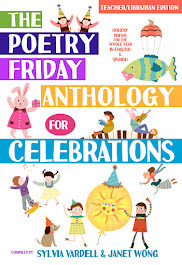 FYI from the award website: The CLPE Poetry Award for a book of poetry for children was launched by the Centre for Literacy in Primary Education (CLPE) in 2003. Winners have included John Agard, Grace Nichols, Roger McGough and Carol Ann Duffy. In establishing this award we wanted to highlight an important branch of children’s literature and ensure that it receives proper recognition. 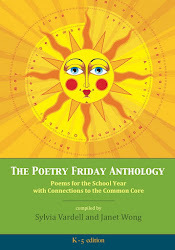 The award is presented annually for a book of poetry published in the preceding year. This conference on Tuesday 15th March 2011 in the British Library Conference Centre, London will launch a new British Library website: Playtimes: A Century of Children’s Games and Rhymes. 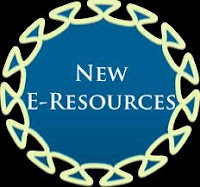 The website contains new material collected during the project, selections from the Library’s ‘Opie Collection of Children’s Games and Songs’ and films and photographs from other nationwide archives. The conference also involves the launch of the associated AHRC-funded research project and a keynote address by Professor Michael Rosen, former children’s laureate. 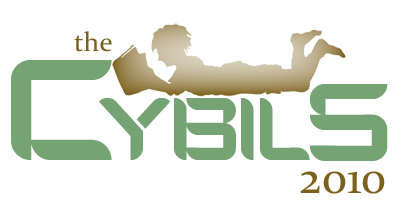 The next Children's Poet Laureate will be announced at the Poetry Foundation's "Lily/Pegasus Awards" presentation to be held at "The Arts Club" in Chicago on May 11. Previous Laureates include Mary Ann Hoberman and Jack Prelutsky. I'll let you know when all these resources go public. 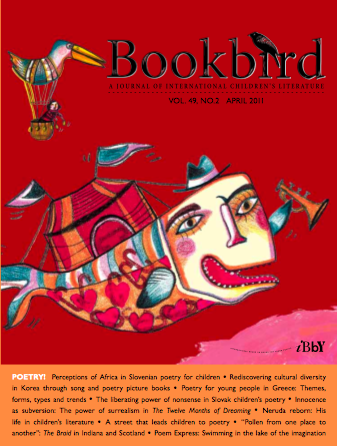 I’m so excited about the April issue of Bookbird, the journal of international children’s literature that I co-edit. The entire issue is focused on the topic of poetry for children and includes 9 fascinating articles about poetry in Korea, France, Slovenia, the Netherlands, Greece, Slovakia, Romania, Spain, and the U.S. To subscribe to Bookbird, go here. 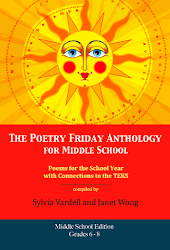 We have tried to include many actual poems and poem excerpts in both the original language and English wherever possible. We are so pleased to feature the poetry of JonArno Lawson, Helen Frost, Alain Serres, Iordan Chimet, Oton Župančič, Niko Grafenauer, Miroslav Košuta, Dane Zajc, Yiannis Ritsos, Dimitris Manthopoulos, Pavlina Pampoudi, Theti Chortiati, Daniel Hevier, Elena Čepčeková, Krista Bendová, Ľubomír Feldek, Miroslav Válek, Dong-min Ju, Pablo Neruda, Shuntaro Tanikawa, and even by children themselves throughout the pages of this issue. Once again (for the 7th year in a row), I’ll be hosting the Poetry Round Up (modeled after the ALSC Poetry Blast) at the annual Texas Library Association conference in Austin on April 15. Participating poets include: Calef Brown, Julia Durango, Margarita Engle, Helen Frost, Kristine O’Connell George, Marilyn Singer, Robert Paul Weston, and Lisa Wheeler. Come join us, if you can. TLA puts on an amazing conference, if I do say so myself! Plus, I'll share more info about this session, even if you can't join us, I promise. 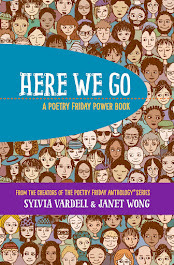 Poet and friend Janet Wong and I are launching the first-ever electronic-only poetry anthology for children debuting on Kindle on April 1. 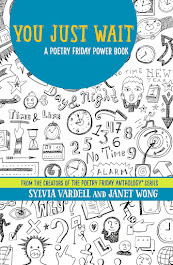 It’s called PoetryTagTime and features 30 poems for children (ages 0-8) by 30 different prominent poets who “tagged” each other, one at a time, offering poems connected one to another. Lots more info about this special project coming soon. We are very excited about it! Meanwhile, head on over to Carol's (Rasco) at RIF (Reading is Fundamental) for this week’s Poetry Friday gathering. 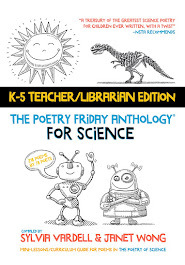 New this week is a poetry book destined to be a sure-fire hit with both kids and science teachers! It's What’s for Dinner? Quirky, Squirmy Poems from the Animal World by new poet Katherine Hauth (published by Charlesbridge). The organizing theme of the book is so appealing: which animals eat which animals (and plants) and how. 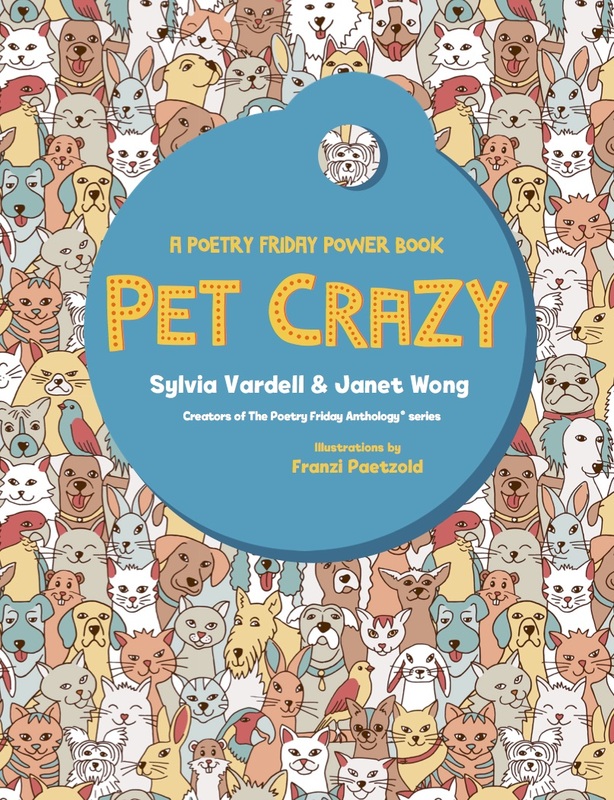 Delve into more than two dozen animal examples told in short, generally free verse poems accompanied by clever cartoon portraits (by illustrator David Clark) that manage to be both helpful and zany. 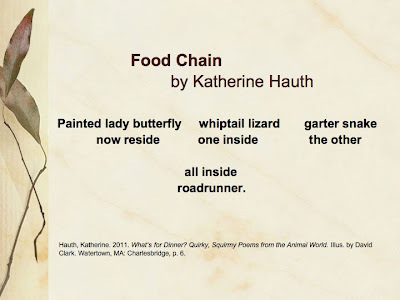 The collection is bookended by theme poems, “What’s for Dinner” and “Eating Words” with 29 clever, succinct, and highly visual poems in a variety of formats in between. The occasional consonance and rhyme are spot on and scan nicely and unexpected syncopations mix up the rhythms here and there to nice effect. Kids will love discovering how crows and wolves help each other eat, how slugs stop other creatures from eating them, four ways polar bears catch seals, and my personal favorite, how “hundreds of beetles and moths” live on the back of the sloth, jumping off his back “on the weekly occasion of Sloth’s defecation” to “lay their eggs on his dung/ with its sugar and starch/ that will nourish their young.” Then, they “jump back onto the back of the Sloth” for another week til the process is repeated. The poem ends, “Quite a menagerie,/feeding in harmony” an excellent summary for the entire book! The combination of true and fascinating facts, the focus on EATING, and occasional references to poop and its necessary place in the food chain are all sure to grab young readers. Bulion, Leslie. 2006. Hey There, Stink Bug! Watertown, MA: Charlesbridge. Florian, Douglas. 1998. Insectlopedia: Poems and Paintings. San Diego: Harcourt. Florian, Douglas. 1996. On the Wing: Bird Poems and Paintings. San Diego: Harcourt. George, Kristine O’Connell. 2004. Hummingbird Nest: A Journal of Poems. Orlando: Harcourt. Harley, Avis. 2001. Leap into Poetry: More ABCs of Poetry. Honesdale, PA: Boyds Mills Press. Lewis, J. Patrick, 1998. The Little Buggers. New York: Dial. Sidman, Joyce. 2006. Butterfly Eyes and Other Secrets of the Meadow. Boston: Houghton Mifflin. Sidman, Joyce. 2010. Ubiquitous: Celebrating Nature’s Survivors. Ill. by Becky Prange. Boston: Houghton Mifflin. Singer, Marilyn. 1989. Turtle in July. New York: Macmillan. 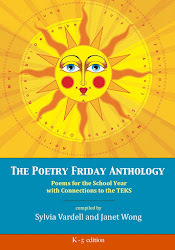 Don't forget to join the throng at Poetry Friday hosted by Dori Reads.